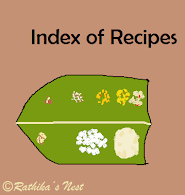 Limited glossary of ingredients mentioned in the recipes is given below. Wherever possible, the ingredients names in English, Tamil and Hindi are incorporated for the benefit of the reader. * A tuber called ‘Pidikarunai kizhangu’ in Tamil. This is different from elephant yam.